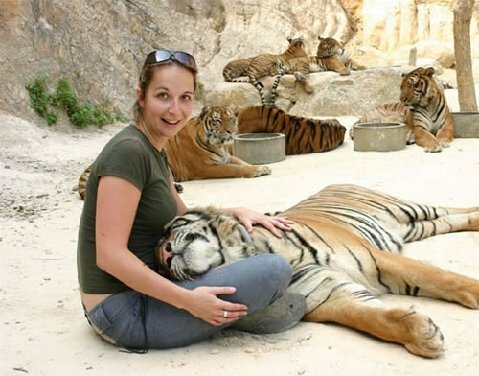 This is the infamous Tiger Temple in Thailand. They have 100 or so tigers. Run by Buddhist monks. They offer, for cash donation, a chance to get your photo with the cats. Authorities have been trying for some time to take the cats. It is not a sanctuary as they breed the cats. A few days ago they took 5 tigers away from the monks. More to follow. I'm not current with why the local authorities want to remove the tigers from the monks. Perhaps they could remain in place, but have the place shut down to incredibly ignorant tourists, who are led to believe these monks have taming powers with which no human has been gifted. As noted before about this imminent threat, tigers will be playful and cuddling one second, moaning in convivial affection, and in that same second spin around taking down a surprised victim under fang and claw. While the monks are lost in misplaced self-satisfaction, their visitors are lost in daydreams of safe photo-ops. DENNIS, help to keep us updated. Using a Buddhist Temple as a tourist attraction is of course very unusual. Temples exist on cash and food donations. This particular place started with just a few young cats years ago. Now it has grown to hold over 100 tigers of all ages by breeding in house. Many speculate that some are drugged to make them docile enough to be photographed with. I have given my opinion on Thai forums that it is is very improbable. Handled by humans from cubs plus the high heat and humidity year round is more likely. Not exactly champions of conservation I do not know why, after years of selling photos, the Thai authorities are starting to clamp down on the temple's Abbott. In the past month there has been talk in the press of tigers being trafficked between Laos, Thailand and Myanmar. So far to date only 5 cats have been removed from temple grounds. My big question is, where would they put all one hundred if they did take all or most ? Unfortunately the temple is not the only place suspected of tiger farming in Thailand. I few years ago I visited a place called the Tiger Zoo. I counted 50 tigers - it was said there were more than 100 living on a few acres. They always have cubs to hold and feed buy tourists. Even sows with a few tiger cubs suckling. Backward thing for sure. But a money maker.